Edinburgh's Royal Mile slopes down from Edinburgh Castle on Castle Rock to the Palace of Holyrood House in the shadow of the mountains of Holyrood Park. Along the way, the route follows the eastern ridge of an extinct volcano - one of several in Scotland's capital. Every Edinburgh hill you walk down is paid for by one or two more you have to climb. In the context of this itinerary, walking up the Royal Mile is no more difficult than walking down it. Some of the best sights are at the bottom. Start there and you won't feel you have to race down the hill to see them before they close. Walking up the mile slows you down so you can pay more attention to the little details you might otherwise miss. Distance: The walk takes in more than the Royal Mile itself - which is slightly longer than a mile. Depending upon how many side routes you take, this walk is between 3.25 and 3.5 miles. It may seem that's crammed a lot in, but this is a doable walk. I'm only moderately fit and I was able to finish - with all the stops - and still return to my hotel for some down time before dinner. Time: The walk is planned to fill a day, from about 9 a.m. to 5 p.m., including stops for lunch, snacks, and window shopping. Facilities: It's an urban walk so there are plenty of places to have a sit-down, a drink or use restrooms. Some parts of the walk are along bus routes which I'll point out along the way. Dress: Comfortable shoes are a must. Take along something to keep you dry in Edinburgh's changeable and unpredictable weather. But don't bother with an umbrella - it can be very windy. One of the best views of Edinburgh is from the top of Calton Hill looking south towards Arthur's Seat and the Salisbury Crags. Edinburgh really is a city with mountains right in the middle. 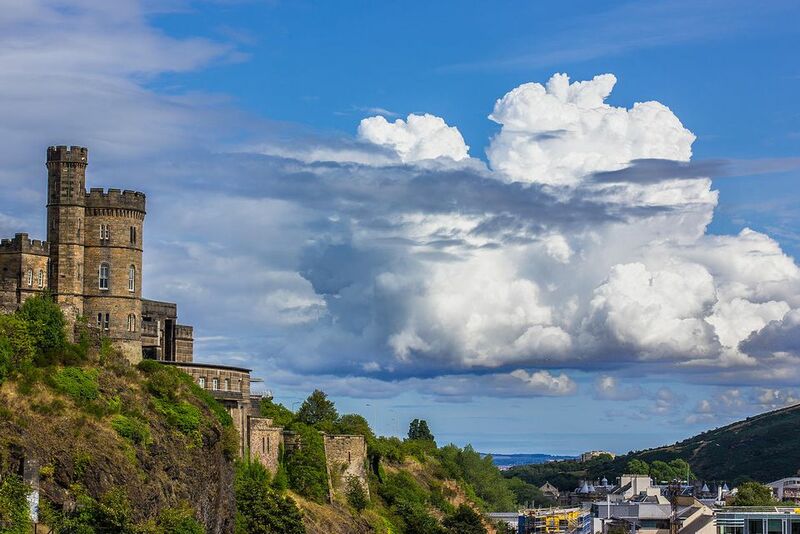 But you don't have to go all the way to the top of Calton Hill to enjoy the view. It's just as beautiful from Regent Road at the base of the hill and the start of this walk. From the end of Princes Street, continue east. and follow the main road as it curves off and climbs to the right into Regent Road (also known as the A1). As the road curves uphill you will pass steps up Calton Hill, on the left, and a large Art Deco building on the right. This is St. Andrews House, home to the Scottish government offices. After St Andrews House, the views open up to reveal Edinburgh's "mountain range". The large, and somewhat dilapidated neoclassical building above the road on the left is The Old Royal High School Building, also known as the New Parliament Building. In fact, this early 19th-century building is neither. It was rejected as a home for the new Scottish Parliament and is currently without a use. Just beyond, on the right, is the Robert Burns monument, a small, circular pavilion. A path down to the Palace of Holyrood House and the Scottish Parliament starts downhill and to the right of this monument. Follow this path down to the right and then left to down to Calton Road. Continue downhill on Calton Road to Abbey Hill. Turn right. There's a small roundabout. Just past it, you will see Abbey Strand and the entrance to Holyrood. Getting there - If you'd rather skip this part of the walk, you can take a bus to the bottom of the Royal Mile. Lothian Buses 6 and 35 stop near Holyrood and the Scottish Parliament. The Palace of Holyrood House is the Queen's official residence when she is in Scotland. (Different from her retreat at Balmoral which is her private property). It dates from a 12th-century Augustinian abbey founded by King David I of Scotland in 1128. Parts of the Abbey still stand and can be visited during the summer. The palace itself has been built and rebuilt several times so it is a mixture of architectural styles. Because it is a working palace, very little of it is actually open to the public but what's there is fascinating. The State Apartments reflect the history and tastes of the different Scottish monarchs who have occupied the palace. There are tapestries, portraits of real and legendary figures of Scottish history and the Scottish Throne Room. The most romantic corner of Holyrood holds Mary Queen of Scots' chambers. She lived here when she returned from France where she was educated and raised. The suite of rooms includes her bedchamber, her prayer oratory, and her outer chamber. There, a year after her marriage to Lord Darnley, her Italian private secretary, David Rizzio, was murdered by her husband, in front of her. The palace is also surrounded by gardens that can be visited. If you're traveling with children old enough to complain but young enough to be bored by royal palaces, consider the Dynamic Earth attraction as an alternative attraction at the bottom of the Royal Mile. Opening Hours: The palace is open from 9:30 a.m. every day except Christmas and boxing day. From April through October, closing time is 6 p.m., and from November through March, closing time is 4:30 p.m. When the Queen is in residence or entertaining state visitors, admission can be limited, so if you arrive toward the end of June or the beginning of July, be prepared to be turned away. Admission: A range of ticket, some of which include tours, joint access to the Palace and the Queen's Gallery and access to the gardens can be booked online or purchased at the gate. Audio tours are included with all tickets. The audio tour takes about an hour. An hour to an hour and a half is sufficient for your visit. The Scottish Parliament is both the dramatic contemporary building that houses the Parliament of the Scottish government and the body of its members, known as MSPs - Members of the Scottish Parliament. It was opened by the Queen in 2004. From the moment it was proposed, in the 1990s, until its completion and beyond, the building designed by Spanish architect Enric Miralles, was controversial. The estimate of its cost, originally proposed at £10 million ($12 million), quickly escalated to £40 million ($46 million). By the time it was finished, it had cost £414 million ($506 million). Visiting the public areas of the Scottish Parliament is free. Don't miss the breathtaking, high tech debating chamber. A variety of free tours about Scotland's contribution to science, art, architecture, literature, and politics are available and can be booked online. It's worth joining one of the frequent, hour-long tours of the building itself to learn more about its craftsmanship, functions, symbolism, and architecture. If Parliament is in session, you can watch from the visitor's gallery. The Parliament building is open Monday to Saturday and public holidays from 10 a.m. to 5 p.m. When Parliament is conducting business, Tuesdays, Wednesday and Thursdays, the building is open from 9 a.m. to 6:30 p.m.
Before moving on take a breather here. The building has comfortable, well-maintained restrooms. A family-friendly cafe sells inexpensive snacks and drinks from 11:30 to 2:30. Dynamic Earth is one of Edinburgh's most popular modern attractions. 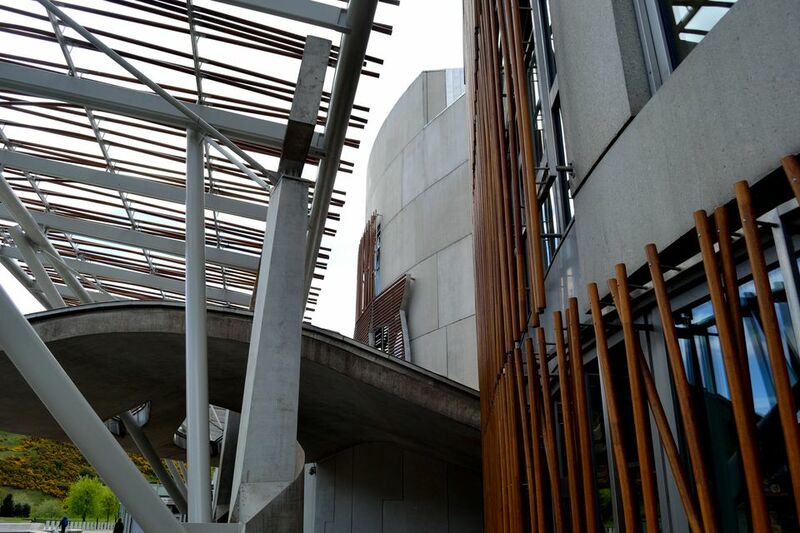 For families with school-age children, it's an alternative to the Palace of Holyrood House. Admission charges are similar to standard tickets for the palace. It tells the story of planet Earth from the Big Bang onward. Fans of earth science, dinosaurs, underwater, jungle and space adventures will enjoy the break from history, politics, and hiking to have some fun. Visitors experience interactive, multi-media and "4-D" features as they travel through time, space and climate zones. Short, family films are shown in the Show Dome, Scotland's only 360 ͦ, digital theater. A visit should take about an hour and a half. The attraction is southwest of the Scottish Parliament. Turn right at the exit from the Parliament building and follow the building around toward the right. After the reflecting pool, (on your left), look for the path around the grassy strip on the right. At that point, you should see a passage through to Dynamic Earth. Now start your walk up The Royal Mile. Return to the traffic circle near the entrance of the Scottish Parliament, on Horse Wynd. On the side of a building near this, you will see a street sign for Canongate. That is the start of the Royal Mile. Turn left. The Royal Mile has several different names. It's Canongate, High Street, Lawnmarket and Castle Hill. Relax, all of it is the Royal Mile. If you can follow a straight line, you won't wander off it. Canongate Kirk - This flat fronted, Dutch-style church is the parish church of Edinburgh Old Town and the Palace of Holyroodhouse. The Queen's granddaughter Zara Philips married her ex Rugby Union player husband Mike Tindall here. According to legend, David Rizzio, the murdered secretary of Mary Queen of Scots, is buried here. It is about a fifth of a mile up from the bottom on the right side. The Museum of Edinburgh - Across from Canongate Kirk, you'll spot a bright yellow and red building. This is one of several 16th-century houses, arranged around a close, that make up the Museum of Edinburgh. The museum tells the story of the city from ancient times. If you are interested in decorative arts and craftsmanship, you really should stop here to see the collections of Scottish silver, cut glass, and woodworking. The museum is free and is open from 10 a.m. to 5 p.m. Monday to Saturday and noon to 5 p.m. Sundays in August. The Museum of Childhood - About a third of a mile further up is the world's first museum devoted to childhood. Your own children will enjoy the exhibits of toys of the past - Dinky cars, dolls houses, games, puppets, child-sized cars, model planes, children's clothes. The museum is free and opens the same hours as the Museum of Edinburgh. A Word of Warning: If you go in here with your kids, you probably won't have time to see anything else on the Royal Mile. Wherever you find lots of tourists, you find touristy pubs and restaurants. So, what a pleasant surprise to find The Inn on the Mile when hunger pangs struck at the same time as the One o'clock gun. Formerly a bank it's now a pub and nine-room, mid-priced boutique hotel. And it's hard to miss. It sits on an "island" on the High Street section of the Royal Mile, between wee Niddy Street and South Bridge Street, with impressive neoclassical columns and granite steps sweeping down to the road. The former banking hall, with its large windows, high ceilings, and original features, is now the pub and dining room. It's relaxed and friendly with an inexpensive menu of well prepared casual food - soups, burgers, sandwiches, salads, chicken, steak, mac and cheese, and a kids menu for smaller appetites. I was staying elsewhere so I only I looked at the rooms, with their luxury bathrooms, free wifi, free minibars and huge windows over the Royal Mile or the bridges. It's definitely on my list for my next Edinburgh visit. After lunch, continue up the Royal Mile past St. Giles Cathedral and turn left on George IV Bridge Street for a detour and a change of pace. Turn right on Victoria Street and follow the curving street down the hill, exploring its colorful shops along the way. Stop at La Barantine, 89 Victoria, to pick up some rainbow-colored macarons for later. Further down it turns into West Bow. At the first intersection, turn right on Grassmarket. This street is known for its restaurants, bars, and independent boutiques. There's a street market here every Saturday from 10 a.m. to 5 p.m. The true story of Greyfriars Bobby inspired a classic movie, one of the most unashamedly sentimental British movies ever made. The faithful Skye terrier pined at his master's grave, in Greyfriars Kirkyard, for 14 years until his own death. Locals fed him and the Lord Provost of Edinburgh paid for his license. After his death in 1872, the Lord Provost's daughter commissioned the statue of him that still stands today near Greyfriars Kirk. To Get There - Retrace your steps up Grassmarket past the small monument at the bottom of West Bow. Bear right onto Cowgatehead and at the traffic circle continue right onto Candlemakers Row. The statue is outside the family and dog-friendly Greyfriars Pub near the intersection with George IV Bridge Road. It's a distance of a couple of hundred yards. You might want to step into the pub to whet your whistle and refresh yourself for the climb back up George IV Bridge to the Royal Mile, now called Lawnmarket. At Lawnmarket, turn left and head for the Castle, just ahead. Is Edinburgh Castle an Anticlimax? I'm afraid it is. Enjoy Edinburgh Castle from the outside. Marvel at the impressive views of it from vantage points around the city center. But don't waste your money going inside. I know that may seem a controversial point of view but it is based on two visits, the second more disappointing than the first. Yes, there are fabulous views, but you can find views just as good, or better, from Calton Hilland Arthur's Seat - and they are free. To get to the crown jewels you have to wind in and out of twenty minutes of small, claustrophobic rooms filled with dioramas and luridly painted plaster figures offering the story of the Scottish monarchy in a style so embarrassing, it's an insult to the history it relates. The crown jewels, purported to be the oldest in Britain, consisting of a small crown, a scepter, and a sword. The build-up to get to their glass case is so long and complicated that they are bound to be a disappointment. And yes, it has Mons Meg - a huge and ancient bombard canon; the Royal Palace where Mary Queen of Scots gave birth to James VI of Scotland, later James I of England; a great hall with an impressive hammerbean roof; a war museum and regimental museums with lots of medals. But it is very disjointed. It's crowded during vacation seasons and basically, there is very little to see. It is simply far too expensive for what it offers. Visit the National Museum of Scotland instead. It covers Scottish history, archaeology, and natural history and its many fascinating and often mysterious objects are yours to visit for free. The museum is just across the street from the little bronze statue of Greyfriars Bobby. So if you've taken that detour, stay a while longer to visit it. Use the time you'll save not wandering around Edinburgh Castle wondering why you've spent so much money to visit it. The good news is, it's all downhill from here and there's probably a nice cup of tea at the bottom. At the top of Castle Hill, a large paved area that looks like an empty parking lot forms a sort of prelude to the castle itself. This is known as the Esplanade and is where the Royal Edinburgh Military Tattoo is staged. Just inside the Esplanade, at the far end, opposite the castle entrance, turn right and head for the corner of the enclosure. A cream colored, multi-story building with tan trim around its windows is the last building on the right before a wooded path that leads downward. Go through the opening in the wrought iron fence and down a few steps. Then follow the path downward, through the trees and parkland. The path is steep in places but is paved throughout and not very difficult. It will lead you to the garden entrance of the National Galleries and the end of this walk. There's a coffee shop at the garden entrance of the National Gallery where you can rest your tootsies before taking in some of the Gallery's world-class collection of fine art. Don't miss the wonderful collection of Scottish paintings. Like most of Scotland's national museums, the gallery is free. If by now you've walked your feet off - and if you've touched all the bases in this walk, you've covered 3.3 miles - you can easily catch a bus, a taxi or the Edinburgh tram on The Mound, in front of the gallery, or on Princes Street a few hundred feet north - and downhill.